Avoiding oops in print jobs is important. Avoiding oops print jobs is important. No one wants to complete an arduous print job just to find small mistakes. 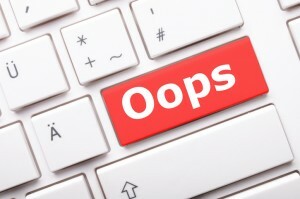 In this blog we’ll discuss how to avoid that oops moment in print jobs. How do you prevent printing mistakes and what tools can you use to facilitate this? Get proof copies, whether physical or digital: Proof copies are always a good idea. No matter if the copies you get are physical or digital, get a backup copy. You can compare the proof copy against what was printed. Redundant copies will also help in case one gets lost in the process of being printed. Make a checklist: We’ve discussed the importance of checklists before. Checklists always help, even if muscle memory and memorization have taken over. There will still be times when your brain short circuits and you forget something vitally important. Moreover, if many people are involved in different stages of a project, having a checklist helps organize tasks. Not only does everyone know what they’re supposed to do, they can see what’s already been done. Get a second pair of eyes on the project: Going along with the previous item, get more than person to look at something. Whenever possible, get someone else, at least one person, to look it over. They might catch something you overlooked. Or they could offer suggestions on how best to print something or make changes before the printing goes final. Pay a proofreader: As with the above item, proofreaders help. Paying them will encourage them and keep them around. Of course, this goes along with making a checklist. One of the items could be “ensure a proofreader takes a look.” In any writing endeavor, having a proofreader keep an eye out for mistakes is a huge relief. While it could be expensive, you don’t want to miss a costly error just to rush a production out for a customer. That would be catastrophic. This entry was posted on Friday, March 3rd, 2017	at 2:07 pm	and is filed under Blog, Equipment handling	. You can follow any responses to this entry through the RSS 2.0	feed. Both comments and pings are currently closed.